Time just rolls around. 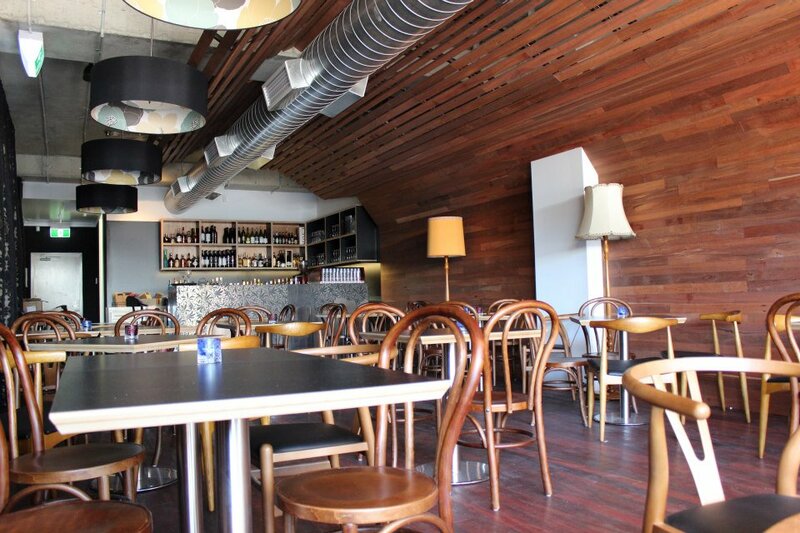 On Friday night we went to Chilli Orange - Kim and Anthony's new restaurant in North Perth - where we were going the night our car was killed. It was fabulous - the restaurant that is - great food and lovely to see them. They work so hard and Anhony is a fabulous chef. He does the best flounder for me. I am amazed just how many people in this area know our ha ha car. People keep stopping me all the time and asking where it is or was it really our car on the back of a wreckers truck. Thanks for all the lovely emails and comments - we have recovered from the burglary but a bit twitchy really - on Sat night there were fireworks out the back somewhere and we were up and alert. We have the studio on alarm at night and gates locked. Have to turn the alarm off every time Harley wants in and out. Harley only ventured back into the studio last night for the first time and very tentative at that. Rugby was not good this weekend - Hurricanes lost and Force got thrashed. Been very busy here working on the e mag. It is starting to fall into place but is going to be a little longer. We kinda a lost a week with all the drama but definitely back on track now. I reckon it will be worth the wait. Loads of articles (where is yours Jacinta?) A Challenge - a free pdf for all subscribers (not saying what on yet but I am working on it) and more. Ian has been very busy tarting up the front page of the website and as soon as the e mag is ready to roll, it will be there in flashing colours. For that reason I have little to show but I have been very busy - but cannot show. I have my On The Surface Studio workshop this Saturday - really looking forward to it - should be a fun day.Means I am about to change focus but I have finished all my work for the e mag and about to clear the decks. I have added a second one on 18th May if anyone is interested. Email me anyway. Off to light the bbq and have a red wine. The butcher gave us 3 instead of 2 sirloins on Friday so I had to go get another one for tonight. I am rolling prunes and walnuts and peach chutney in bacon for starters. Thanks to all the poeple who have taken some to experiment with. I think I have enough people working with it now - I shall share what they do when their excitments come back. 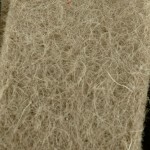 We have just received a shipment of thermoformable wool felt - 90% wool/10% polyester. If you are interested and think you could do justice for me in a couple of weeks, please email me mail@thethreadstudio.com and I will send you a couple of pieces. We are selling them 50cm x 50cm - a nice big size. All I need then is for you to return your excitements back to me and we will pop you on the web in your glory. It's meant that we have wasted a day feeling sorry for ourselves. Our insurance excess is too high for a broken window or a laptop (simple one I have all my arty farty stuff on and watch videos and print stuff from) and there is lots of stuff to clean up including glass everywhere, now that the forensic man has been and gone. Yesterday I played with paste and tissuetex - result above - looks better in the real but given me lots of ideas for working with my favourite abaca tissue. I have also been using paste on silk fibres - interesting surface for stitching on. When we were in Broome, this little cat popped in every day and was even found sleeping my my suitcase but no, we did not bring her home. She enjoyed our leftovers though. She is about 1/4 the size of Harley. 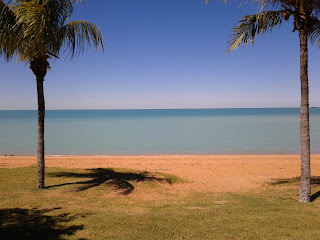 Town Beach in Broome - the colours of the sea are wonderful. 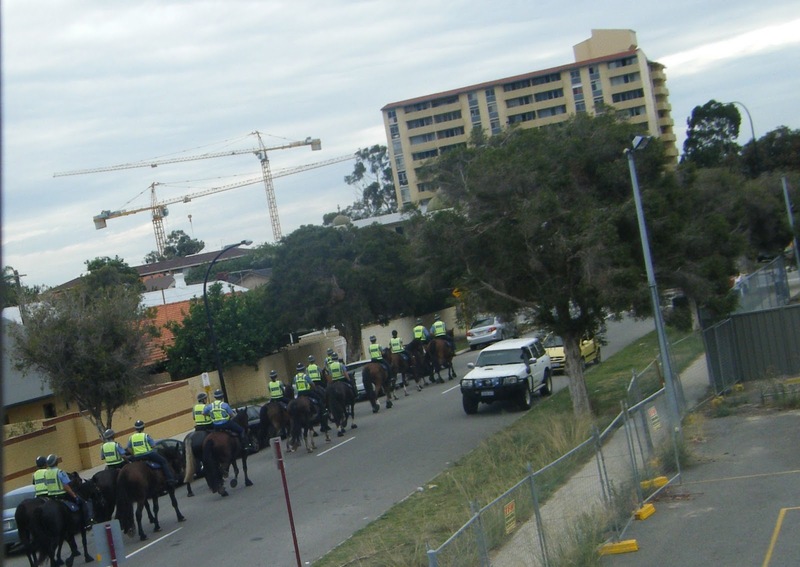 Last week the police horses came down Smith Street - I saw them going down the street and missed a photo but Sara next door caught them going back up. They used to trot up and down a lot a few years back but haven't seen them for ages. Sort gives a wonderful calming feeling to the area. Because I couldn't do things, I cut up all the prefelts in the back garden. We have some new mouldable felt - the first 7 colours arrived on Friday and the rest are due Tuesday. I am looking forward to playing with it and sharing what I do. Ian has loaded 4 lovely new stencils to the web - Arabian Nights series - sound like me. Three cases of Gelli Plates arrived - one is all gone - I need to try these new stencils on mine. But - tomorrow I have to do all of today's activities, hopefully with a clear head. We did not get injured this week, only got pissed off. A textile artist's STUFF is fortunately not appealing to a burglar looking for lap tops, jewelry, iphone, cash (that was obvious because every little bag with a zip and a thought of contents was out. Thanks though I found my scissors which was in one bag. Let's hope next week is an improvement. We are off for a drive in our hire car because we have one. Rest in peace little ha ha car. We had you for 12 years - you owed us nothing - we drove you every day to places local like the swimming pool, the post office, the butcher, the shopping for food shops, and occasionally a little further around town. You were parked on Smith Street daily and had often been side swiped but we had planned to keep you rolling along for at least another 6 months until we decided that you should be put out to pasture. You are the only car we have ever had where the windscreen wipers came on when the lights were turned on and even though you cost us $500 for fixing this and few other dramatics (caused by a side swipe) it was our prerogative to call you useless and a ha ha car. However, Suzel, a p plater driving her BMW sports car (night photo above) fixed all of that. After a very busy day on Wed, we were enjoying a red wine in the back garden getting ready to drive off to Anthony and Kim's new restaurant Chilli Orange, when we heard a car roar around the corner at the bottom of Smith Street and crash loudly into an innocently parked car on the side of the road pushing it into another innocently parked car. How anyone can come around that roundabout at that speed is a wonder but who knows if she was texting or anything - the point is she didn't brake, possibly panicked and accelerated. She was all very dramatic. We knew it was the ha ha car because its very noisy alarm system started up. So we are in trauma. Of course it doesn't look that bad but the side and back bashed in and the front bashed up and being an old car means it is not worth repairing. Since it is worth very little we will receive nothing much of nothing. Suzel's daddy has probably already bought her a new BMW sports car...... In the meantime we have hired a No Birds car- the ever popular white hire car from Bayswater. I have only been out in it a couple of times but already people are asking where the little green car is. Sadly at the knackers yard. Little car did get a little revenge - its alarm system went off twice through the night (poor Ian had to get up, put on clothes and go out to turn it off) and it held the rat run of cars up for a short while in the morning when the tow truck arrived. Boy, people are impatient about having to wait for a car to be towed onto the back of a truck. So sadly I will not bore you with tales of our little car again. 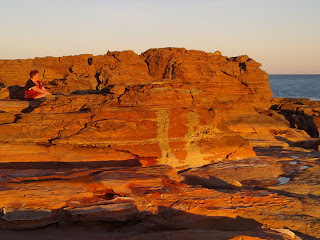 and we went to Port Beach to watch the sunset - don't you love how the rocks change colour? Magazines - we have had 4 arrive in the last short while - Art Journalling and Modern Patchwork both sold out on the day they arrived. I always get extras but they went too. Also we got Somerset Studio (I took a copy to Broome with me and thought it is a good magazine - I used to buy it years ago) and Down Under Textiles 10 came as well - I have an article on de Colourant. We still have a few copies left. So it has been a very busy but very traumatic week. We had a little wake in our back garden last night with a bbq - Jake at the butchers chose me a couple of lovely steaks and we enjoyed a lovely glass or two of Eldertons red for the passing of an era. We have now owned 3 cars since we came to Perth in 1978. Let's hope that both the Hurricanes and Chiefs win their rugby games today. Well I reckon we needed this little break - we have slept well, read lots and swum lots as well. 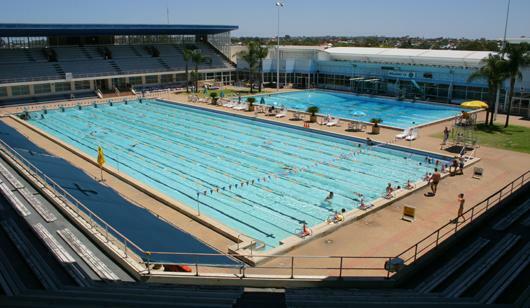 I love hopping in and out of the water but prefer it when people drinking and hopping in and out fully dressed, are absent. Little gripe but we ignored them. 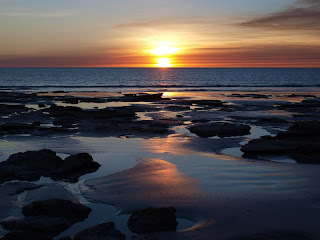 Been a busy week with this and that but tomorrow morning we are flying off to Broome for our break - everyone else goes away at Easter and we love it here so what better time than to go when they are not. 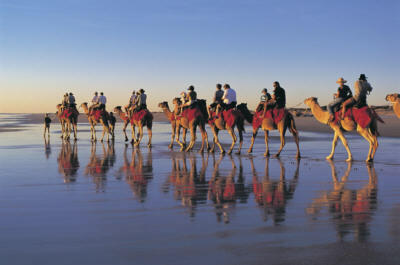 We are staying near Cable Beach again where we always go - this map is of the town. Here is a sunset - hope to see plenty like this but I have packed my cream stuff so I don't get bitten like one other time. Here are the camels on Cable Beach but we shall only look at them. I have lots of goddies to take - my big folder for threads.In-fusion e - mag work - we are getting there just bogged down. Plus all my Kimberley Dreaming stuff to work on - plan to visit the markets and buy soap and lots of lovely fish for our nightly bbqs. Well only a few nights - we will be back on Monday night. I announced a studio workshop - On The Surface - it filled up pretty fast. If there is interest I will run a second one 2 Saturdays later - on 18th May. Check out the tab at the top of this page for details. It's Saturday again. Can't believe where each day goes. We have been having nasty record temperatures in Perth and when you step outside it is like stepping into the shimmering desert - in April. BUT - I must say that the mornings and evenings are lovely and we really enjoy sitting outside at night and then enjoying a bbq in our lovely back garden. Very easy to feel like royalty in your own kingdom. Talking of kingdoms, I have been busy researching my ancestors and back we go to William of Normandy and loads of others including the King of the Carpark aka Richard 3rd. Ian says it makes sense, cheeky man. Easy to trace back through my paternal great granny because everyone has info about royalty and wealth etc (shame about the ancestors hung in the Tower and shot out shooting) but there is no info about the common folk. I cannot make any progress with my paternal grandmother can you believe - well her surname WAS Smith but that's no excuse. Great win today by the Hurricanes - well done boys. Sadly the Force fell short again. Loads to do but you have to take a break and keep the brain busy.